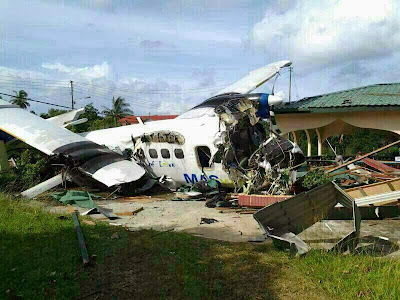 Maswings aircraft plane crashed near a Sabah residential area. The plane is inside the house yard reported no injuries of the household but the death of a young pilot. Fewer victims with grave injuries were sent to hospital for treatment. Several death has been reported during treatment in the hospital. The crashing zone was very nearby kudat airport, in fact witness said, it just behind the kudat airport. "it should landed at airport track, why it landed here" one of the eye witness said the incident. The residential area have been identified as kampung Sin San. The house owner is Qayyum Amirdad. He was working while the plane crashed it car porch. He was terrified at the incident happened and worried his family as they were at home during the incident. New strait time quote : " the house owner wife and his children leave the crash site unhurt. The full-body plane can be seen here clearly. 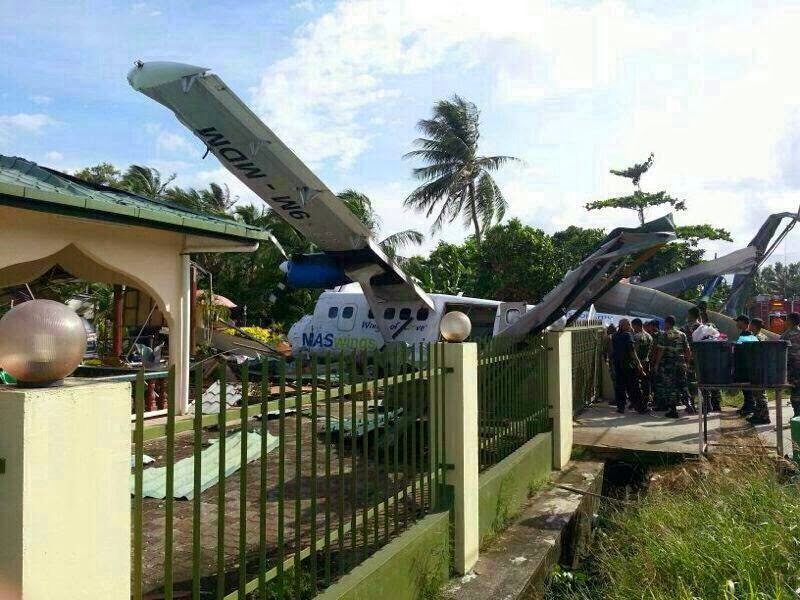 It also clearly showed that it is exactly Maswings-owned aircraft plane. There were death and injuries occurred. New strait time quotes: Tan Ah chai , 96 years old were found treatment has been impossible died at hospital. Second victim is Co-pilot Marc Joel Bansh, 23 years old, died at Hospital Queen Elizabeth at 9pm. The crashed maswings was scheduled as Flight MH3002, arrive from KK to Kudat 2.45pm. Kudat to Sandakan flight will be commenced at 3pm. The plane supposed to be land at Kudat and fly to Sandakan later. The plane carrying 16 passengers and were reported 6 have been gravely injured. The horrific incident were being saved by Firefighter department. Sabah Fire and Resuce department deployed 10 skillful Firefighters who helped to rescue victimised passengers. It remind me of the double 6 incident which all the powerful people in politic were killed after a talk with peninsular Malaysia political leaders. The difference with this Maswings incident were loss of great Sabah leader at that saddest old day. It is a history now.